Massage is a highly effective way of helping to improve blood flow and circulation, create inner calm, and improve the function of your lymphatic system- all this as well as a whole host of other benefits such as improving the tone and complexion of your skin. There are many benefits to massage that can help you feel better and look better too. Massage has been around for many centuries; ancient cultures embraced massage as a way to treat common ailments and imbalances as well as more terminal diseases and conditions. Massage is a safe, wholly natural, and potent option to remedy pain, stress, and anxiety, all the while providing great benefits to your skin. Massage uses gentle friction to help eliminate dead skin cells, this enables the fresh cells to rise to the surface- removing impurities and regenerating your skin to achieve a healthier glow internally and of course, externally. Stress is something that we all suffer with from time to time, and it is the way in which we manage it that makes all the difference… massage helps us to do this by nourishing our circulatory processes and empowering the natural flow of our body. It is simply a great way to relax as well as rejuvenate. Our cells and tissues are masters of regeneration but we can give them a helping hand through massage! Here are some other benefits to your health by utilizing the power of massage! Energizes you and revitalizes your skin- a youthful glow can be achieved through regular massage- stress really messes with every part of our body but that inner chaos can be calmed and alleviated through massage techniques! So, what’s the simplest way to start incorporating massage into your daily schedule without needing to make an appointment at a parlor or spa? Dry brushing of course! Dry brushing is a way to bring massage into your home so you can begin reaping the benefits mentioned above. Your skin is the largest organ in your body, so it deserves to be treated with plenty of care and respect. The health and wellbeing of your skin are also linked to other organs and internal systems throughout your body – so while you may not think that the health of your skin has anything to do with your internal organs, it actually matters quite a bit! Indeed, dry brushing is an excellent way to invigorate several major processes and organs within the body. For maximum benefits, make sure to include dry brushing in your bath and beauty routine at least 2-3 times per week! Rengöra brushes provide an at-home spa experience helping you to detoxify your body by stimulating your lymphatic system. Rengöra is based in South Pasadena, California and focuses on bath and beauty products that promise to deliver the ultimate bath time experience. In Swedish, Rengöra means “to brush” or “to clean.” This word therefore simultaneously describes the purpose of Rengöra's products and reflects company Scandinavian roots. The Rengöra Exfoliating Body Brush is luxurious and invigorating; this brush ensures you receive a soothing, dry brushing experience! Their dry brush products enable you to reach the hard to get to areas so you can fully invigorate and add a healthy all-over glow to your skin! The simple act of brushing in circular motions from your feet all the way up to your arms and torso will help to improve circulation throughout your entire body. It will help you feel more energetic each morning you dry brush, as well as prepared to face whatever the day has in store for you. It will help improve the overall functioning of your body: blood and nerves will be able to move more efficiently through your veins and the nervous system, and you may even experience greater mental clarity as a result. Dry brushing will improve the look and feel or your skin in several ways, making it soft to the touch and also incredibly healthy and clean. Exfoliating with a dry brush will both unclog your pores, giving your entire body a healthy glow and complexion, and also encourage better nutrient absorption when you go to moisturize in or after your shower. Exfoliating with a dry brush several times a week will also get rid of excess dead skin cells, making your skin both smoother to the touch and brighter to your (and others’) eyes – your skin will be beautiful inside and out! There are several benefits to practicing facial massage rolling and gua sha, and therefore several reasons you should be using them! Firstly, Rose quartz itself is a highly calming element, which makes it the perfect tool to use on irritated or sensitive skin. Improve Circulation- One of most widely reported benefits of rose quartz rolling and gua sha massage is improved circulation, which can lead to health and appearance improvements throughout your body. While using these tools for facial massage, you should see improved circulation on your face, which can help the skin feel and appear healthier, and also lends a natural glow to your skin. Release Toxins & Improve Your Body’s Lymphatic System- Rose quartz has been believed for millennia to heal stressed organs and rid toxins from the body. 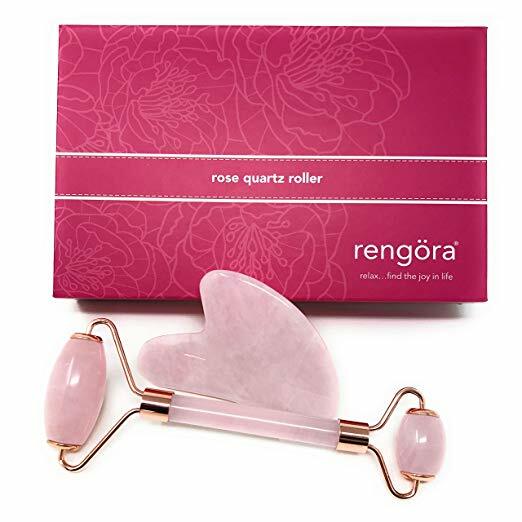 As you will see, both the gua sha stone and the rose quartz roller promote improvement in the body’s lymphatic system, which can then help the skin release toxins and reduce any inflammation. De-Stress- As you probably have experienced or heard before, massage is an amazing way to help de-stress and release tension from your day. But have you ever tried facial massage? Both the rose quartz roller and gua sha stone are amazing tools to help you de-stress, while you improve the quality of your skin. Improve Skin Quality & Stimulate Cell Growth - During rose quartz rolling, the skin is firmly yet comfortably massaged, while in gua sha treatments, the skin is gently scraped: both of these treatments promote oxygenation within the blood and cell growth and regeneration, ultimately improving the overall health and quality of your skin. Overall, the increased circulation caused by rose quartz rolling and gua sha massage can improve your skin tone, reduce puffiness and wrinkles, and even boost the elasticity of the skin. Using a cold stone during massage will help tighten pores, thereby decreasing the likelihood of breakouts and keeping harmful toxins, such as those found in air pollution, from entering your skin. In addition, rose quartz helps to increase and boost the skin’s natural immunity and defenses, further promoting healthy skin cells. Rengöra tools and products enable you to gently massage your face for improved complexion and vibrancy and the areas of your body that are affected by cellulite- gradually decreasing the appearance of it by improving circulation in the area, removing toxins, and encouraging lymphatic drainage! Rejuvenate - Revitalize – Invigorate with Rengöra! * In partnership with our friends at Rengöra * The information available on ewellnessmag.com, including text, graphics, and other materials are for informational purposes only. Reliance on any information in ewellnessmag.com is at the user's own risk. Sponsored product placement may appear in the article. The visitor of this website acknowledges that the information available on or through ewellnessmag.com is not and is not intended to be a substitute for professional medical advice. Copyright © 2019 Brawo Press, Inc. All rights reserved.